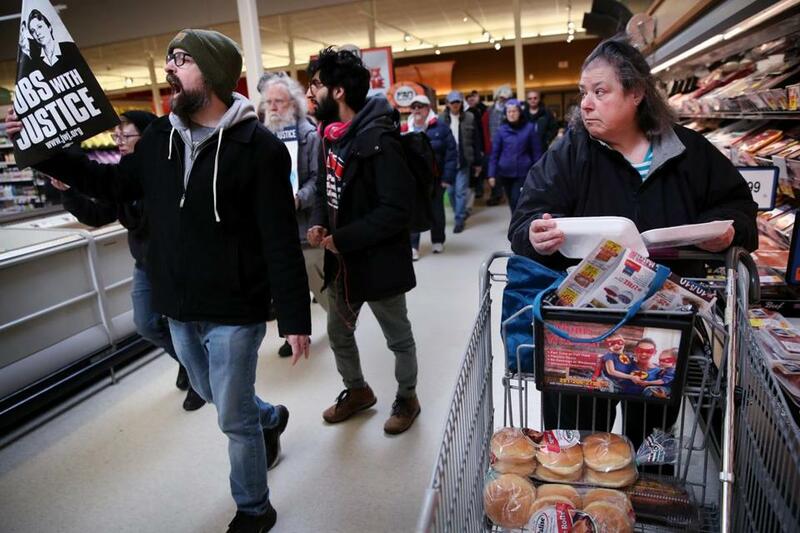 A shopper watched as Jim Carvalho (left) marched with fellow members of the United Food and Commercial Workers Union and their supporters during a rally Sunday at the Stop & Shop in Somerville. SOMERVILLE — Stop & Shop workers and supporters rallied and marched through the company’s McGrath Highway store Saturday demanding a fair contract as negotiations are set to resume Tuesday in hopes of resolving a weeks-long dispute with the grocery store chain. “What do we want? Contract! When do we want it? Now!” protesters called out as they marched into the store, bringing a marching band. 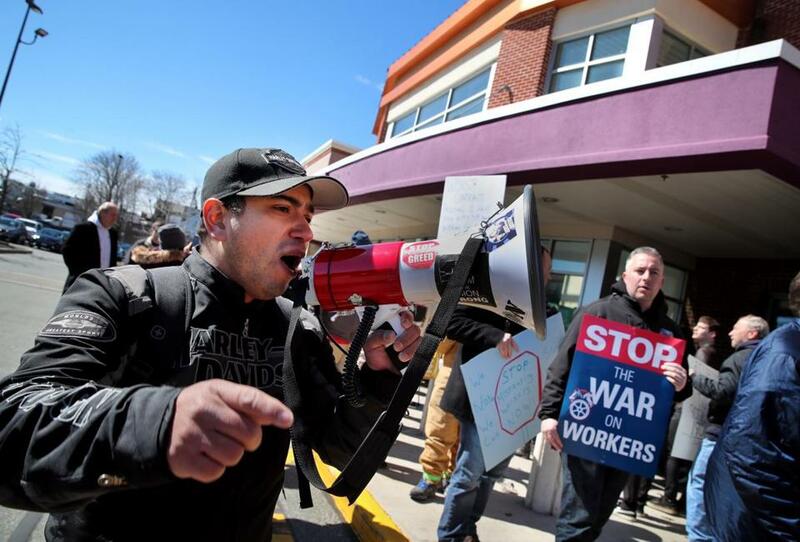 The peaceful protest came less than two weeks after union leaders representing more than 31,000 Stop & Shop workers in Southern New England authorized their labor leaders with United Food & Commercial Workers to call for a strike. “The company is trying to gut our entire contract in this great economy when they are making great money,” said Jeff Bollen, president of UFCW Local 1445. Union leaders oppose the proposed contract’s changes, which they said would cut wages, pensions, and health insurance. The company has also cut staff and relied more on automation, he said. The workers remain on the job. The sides are due to resume talks Tuesday, according to Amy Ritter, a UFCW spokeswoman, and a statement posted to the Stop & Shop website. Saturday’s “Customers Care” protest included representatives from several area community groups, including Massachusetts Jobs with Justice and Somerville Stands Together, said Gillian Mason, a co-executive director with the organization. The 73-year-old, whose tenure with Stop & Shop goes back to its original owners, said management’s relationship to workers and shoppers has changed over the years. Kristen Johnson, who has worked for Stop & Shop for 12 years, including eight years in Somerville, said the demonstration showed how much support the store’s workers have in the community. Among the local elected leaders at the protest were state Senator Patricia D. Jehlen of Somerville, state Representative Michael Connolly of Cambridge, and Jesse Clingan, a Somerville city councilor. As demonstrators marched into the store, curious onlookers filmed the scene with their phones. And as the procession made its way past the checkout counters, several Stop & Shop workers who were on the job grinned and joined the protesters’ chant. The march only lasted a few minutes — enough for the protesters to march around the store twice, and then leave peacefully. Corpuz is a psychology professor at the University of Massachusetts Boston, where in recent years, faculty, students, and staff have participated in on-campus demonstrations against issues like budget cuts and tuition increases. Customer Amandeep Agnihotri, who left the store shortly before protesters entered the building, said he supported the workers in contract talks. He said Stop & Shop workers should have a fair contract. If they were to strike, he’d refuse to cross the picket line. “I would stop shopping here,” Agnihotri said. Rally organizer Fabricio DaSilva spoke to participants. Clarification: A previous version of this story indicated that Stop & Shop representatives didn’t respond to emails Saturday. In fact, because of a technical glitch in the Globe’s email system, Stop & Shop representatives didn’t receive the emails.